This November 2018 supplement consists of: 1. A PDF report highlighting the findings of an August-October 2018 survey of US patient groups on patient-centric R&D; and 2. An accompanying 33-page Appendix analysing the many comments received from the respondent US patient groups. The supplement aims to be a guide to pharma strategy, and to inform regulators. Since 2016, the Food and Drug Administration (FDA) has been actively promoting programmes which put patients at the heart of drug research and development (R&D), through its 'Patient Focused Drug Development' (PFDD) initiative. The PFDD initiative invites patients and patient groups to participate in the process of drug R&D from the onset, so that the output of pharma's R&D can better reflect patients' needs and concerns. Aside from the FDA-organised meetings, the federal agency has encouraged, and been involved in, external meetings arranged by patient groups in different therapy areas. Coming against the backdrop of a growing drive toward patient centricity in the pharma industry, the PFDD initiative could bring significant consequences in the way that future drug R&D is conducted—not only in the US, but elsewhere, too. Several international and Europe-based, multi-stakeholder consortia are also discussing how patients can be better engaged in R&D. The difference between them and the FDA's PFDD is that the latter is actually putting ideas into practice. Because of the importance of the FDA’s PFDD initiative, and the heightened activity of US patient groups in drug R&D, PatientView decided to conduct a survey of patient groups in the US on the subject. The survey ran August-October 2018, and this report (and Appendix) contains the survey’s results. 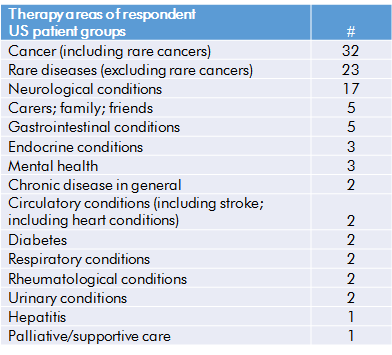 The study's 104 respondent US patient groups were asked about 4 important topics: (1) How patient groups define patient-centric R&D; (2) Their views on the FDA's PFDD; (3) Their views on pharma's performance at being patient centric in R&D; and (4) Their views on the role of 'real-world' evidence versus clinical trials. 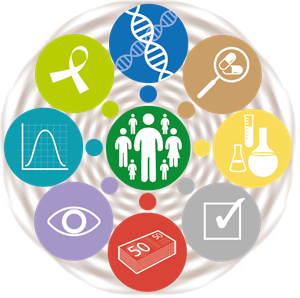 The report and Appendix analyse the opinions of all of the respondent US patient groups, and, more specifically, the responses from US patient groups specialising in cancer, rare diseases, and neurological conditions. The study’s 104 respondent US patient groups were self selecting. The majority are involved, one way or another, in R&D-oriented activities. 18% have an international remit. From the feedback received, the vast majority of the US patient groups responding to the August-October 2018 US PFDD survey consider that activities undertaken during R&D should always incorporate the patient perspective, and 56% of the respondent US patient groups think that the main outcome of engagement should be R&D investment which truly addresses patients’ needs. R&D investment which demonstrates that it truly addresses patients’ needs. Examining how the output of R&D affects the COMPLETE patient life experience. Patient-friendly protocols for clinical trials, and post-trial follow up. 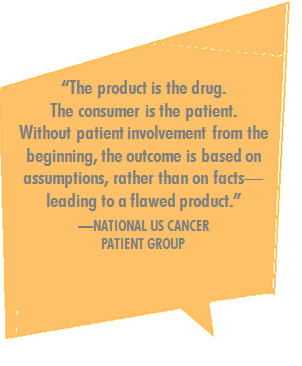 All parties involved in the clinical-trial process consider the patient perspective. Patients are made aware of, and are able to participate in, clinical trials of relevance to them. But, most US patient groups also believe that much of their understanding of what makes effective patient engagement in R&D is NOT yet happening in the US. Only a minority of the respondent US patient groups believe that other healthcare stakeholders are willing to engage with patient groups on R&D activities. Not surprisingly, then, 98% of the respondent US patient groups declare some sort of interest in the FDA's PFDD initiative (only 2% are not interested). Around one third of the US patient groups have already been involved with the FDA's PFDD initiative in some way. Almost 40% are interested, but not sure how to engage. Key concerns: Despite the tangible excitement among the patient/patient-group community about the possibility of interaction with drug R&D, many concerns about the FDA's PFDD are aired by respondent US patient groups (particularly those actively engaged in the FDA's PFDD). Above all, 65% of US patient groups worry that the PFDD processes will listen to patients’ opinions—but not act upon them. 56% of the US patient groups declare that they lack the resources for becoming involved in PFDD. Over half of the respondent US patient groups state that they work in general with pharma to improve patient engagement in R&D. 28% of the US patient groups state that they have worked with pharma on the FDA’s PFDD initiative. But, clearly, from the many comments received from these organisations, pharma could significantly improve these types of relationships. The 104 US patient groups were asked to list three optimum ways in which pharma could be more effective at engaging patients and patient groups in R&D. The hundreds of comments were analysed and weighted on the frequency of mentions, to produce a 'wish list'. Patient groups also provide advice about how to attain the 10 goals. The initial Being Patient Centric (BPC) toolkit was developed in 2017 by PatientView with the support of thousands of patient groups. The toolkit is intended to help pharmaceutical companies become more patient centric. BPC supplements expand on the core themes developed in the initial 2017 toolkit. An evidence-based approach lies at the heart of all of PatientView’s BPC publications. Supplements 1 and 2 (November 2018) both focus on the subject of patient centricity in R&D. The 2nd BPC supplement—a global overview of patient centricity in R&D—will be published in the next few weeks. If you do not wish to receive any emails from PatientView, click on "Unsubscribe".